The economic recovery may be continuing, but small business owners aren't ready to put the rose-colored glasses back on. 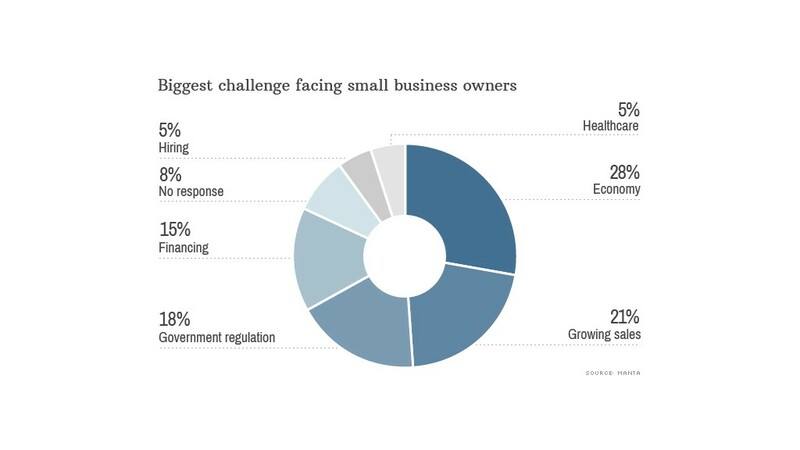 According to an exclusive CNNMoney-Manta survey released Tuesday, 28% of small business owners said the economy is the "biggest challenge" they're currently facing, topping issues like sales, regulations and financing. The survey polled over 1,500 small business owners across the country. Even those experiencing revenue growth are hesitant to test their luck. "We've done well as a small business, [and] banks are willing to lend us money," said Victoria Aguilar, the founder of a small law and consulting firm. "But is it safe to bring on another employee?" Aguilar opened the The AR Group in Greenwood Village, Colo., six years ago. Her firm, which employs six people, averages 10% to 20% revenue growth each year. She's wanted to expand her services to include immigration law for more than two years, but is hesitant. "It's a hard decision. There was a point in time where I wouldn't have been so reluctant," she said. "We're not entirely certain that the customer base is willing to spend money. People are trying to solve their own problems." She also sees this in her clients, who are emerging and mid-market businesses. "There's a timidity of opening purse strings," said Aguilar. "If the economy doesn't continue to heal, or reverses, all of us want enough [savings on reserve] so we aren't another statistic." Even those with few overhead costs, like entrepreneur Leah Ellis of Snohomish, Wash., worry about the economy's impact on business. Ellis runs two businesses out of her home: Toto's Pet Care, a pet sitting service, and Java Tech, which installs and services espresso machines. Ellis feels the impact of corporate layoffs in her state, like Microsoft (MSFT) and Boeing (BA), as many of her pet-sitting clients work for these companies. "When they get hit, I get hit," she said. According to the National Federation of Independent Businesses' monthly survey, many small business owners expect conditions to get worse -- not better -- in the next six months. For Christina Halpain, who manages J Machine in Lake Forest, Calif., it's important to be nimble. Halpain said J Machine, a manufacturing firm that builds equipment like dental machinery, has only experienced 2% to 3% annual growth since opening three years ago. She and founder Jeremy Moseid traveled to China in February to explore possible outlets for outsourcing manufacturing to cut down on costs. Halpain, who is a contract worker, said tax relief and tax incentives would be "ideal" to help grow their business. She feels California could be doing more to help small business owners -- and she's not alone. Manta's survey also found that 58% of small business owners plan to vote for a challenger candidate in the midterm elections. "We need to have politicians in office that are looking at the opportunities that small businesses need to flourish," said Halpain.